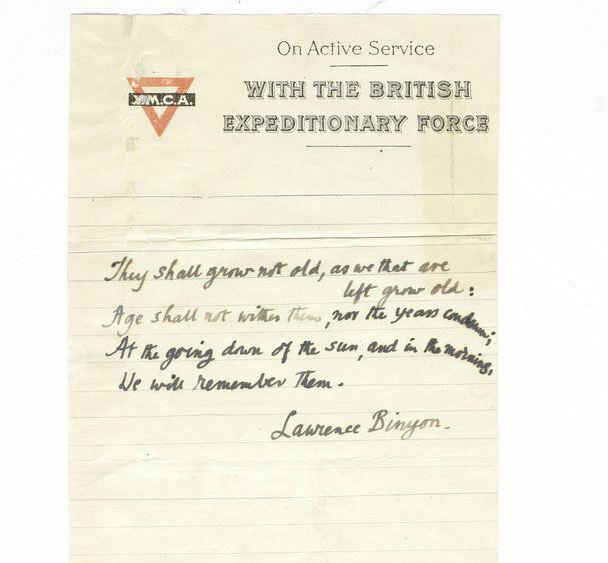 Bonhams is to sell a copy of the last and most famous stanza of For the Fallen which begins, "They shall grow not old", handwritten by its author, Lawrence Binyon. It will feature in Part I of The Roy Davids Collection Part III: Poetry: Poetical Manuscripts and Portraits of Poets at Bonhams New Bond Street on 10 April offered at auction and is estimated at £5,000-8,000. The final verse of For the Fallen is commonly known as the Act or Ode of Remembrance. For many it is the emotional climax of Remembrance Sunday services not only in this country but throughout the Commonwealth and the words are often engraved on cenotaphs, war memorials and on headstones here and in the war cemeteries of northern France. The copy for sale was written some time before 1918 on British Expeditionary Force (BEF) headed note-paper. This is especially appropriate because when Binyon wrote the poem originally, in 1914, it was to honour the dead of the BEF on the Western Front and he later served as a volunteer medical orderly alongside BEF troops during 1915 and 1916. He was too old for active service. When For the Fallen was published in The Times in September 1914, casualties had started to mount and the promise of a speedy end to the war was already fading. The poem, and its final verse in particular, became and remains today a dignified and elegiac expression of national grief. The full text of the final verse reads as follows: 'They shall grow not old, as we that are left grow old: Age shall not wither them, nor the years condemn; At the going down of the sun, and in the morning, We will remember them' Source: bonhams press release.